Some things in life are inexplicable. You can't necessarily put into words how or why they have affected you. 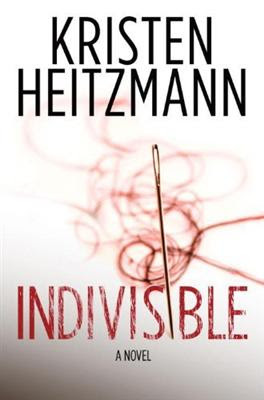 "Indivisible" by Kristen Heitzmann is like that. She weaves a tale full of complex, unusual characters caught up in bizarre situations and makes it all come together skillfully. The story starts slowly, and I will admit, I was often frustrated by the allusion to certain details concerning the back stories of several characters. If books are paintings then Ms. Heitzmann is a master of pencil sketching. You get enough lines to see the pictures but it is mostly outline. The finer points are left to your imagination. However, enough information is provided eventually to completely pull you into the story and entice you to see it to its completion. The story follows two main characters: a shopkeeper named Tia and her old flame, Jonah, the small town's chief of police. The title of the book represents the indivisibility of several aspects of the story and the relationship between Jonah and Tia is one of them. Both have been badly damaged in the past and instead of allowing their pain to unite them, they lash out at each other, but when gruesome crimes start happen they are drawn together. It may start slowly, but it gathers speed after the first several chapters. I thought it was worth the wait. Ms. Heitzmann has a different style, but I grew to like it. She paints her characters as both aggravating and amiable. In a word, they are human. I admired how she wove a Christian view point in without being patronizing or preachy. I would definitely recommend this one. If you are willing to patiently invest in the initial story development you will be rewarded in the end. Ms. Heitzmann uses that as build-up to give you a better understanding once the story picks up. Once she hits her stride you won't want to put it down. I was given a complimentary copy of this book by Waterbrook Multnomah Publishers in exchange for my honest, unbiased review. P.S. If you click on the book cover above it will take you directly to the publisher's site where you can find more info on the book and purchase it! P.P.S If you aren't sick of me yet, could you PLEASE take the time and rank my review below? Thanks! It's been "ranked." Hope it helps! Her books are pretty good, I read one about a Hawaiian adventure with amnesia--I think, its been awhile. I liked her characters--nice plot and it moved quickly. Freefall, I looked it up--my Mom and I played book swap with it a few years ago when we went to UTAH!